Land of Lotus is the name I have given to side of my creativity. 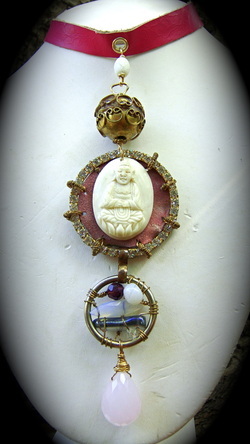 I love making jewelry and repurposing old and forgotten pieces. As many of you know the lotus flower emerges from the mud, many of our personal stories can relate to this truth, many of us must struggle to find our place in the world. The act of creation is an act of curiosity, we embark on each journey as a child welcomes playtime, I love nature and stones, I can always remember precious stones around me since I was a tiny child, all the stones used on my jewelry have been exposed to the sun and the moon in my effort to deliver a piece that has been blessed with love and the elements. 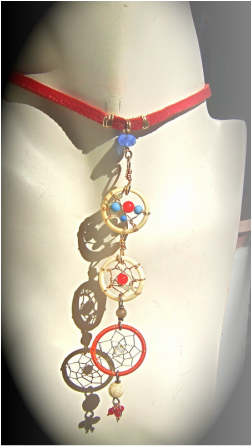 Dream catcher choker, I was inspired by a trip to the Inca Valley in Peru, the white hoops are carved bone, turquoise and coral, the bottom dream catcher is from the valley. The length is adjustable.